This month we’re focusing on volunteer topics, since many non-profits and membership organizations are ramping up their volunteer programs at this time of year. So we thought you might be interested to see the latest research findings on the state of volunteering in America. In December, The Corporation for National and Community Service (CNCS) and the National Conference on Citizenship (NCoC) released its annual “Volunteering and Civic Life in America” research report. The good news is that volunteering remains alive and well in America. This national study found that 64.5 million Americans volunteered nearly 7.9 billion hours in 2012, for a total estimated value of nearly $175 billion. 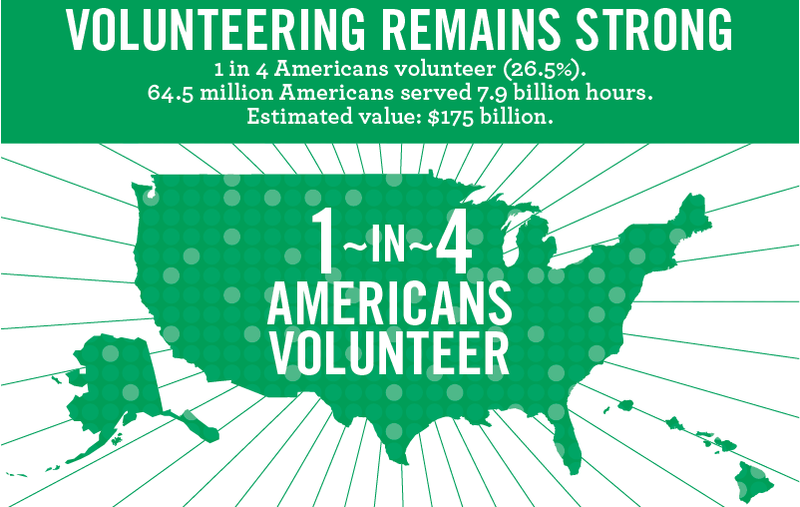 Apparently, that amounts to 1 in 4 Americans volunteering! And while the data suggests that parents and Gen Xers are leading the way, the research found that the commitment to volunteering spans the generations. The volunteer rate of Generation Xers has trended upward over the past 11 years, increasing nearly 5.5 percentage points, and Generation X has the highest volunteer rate of any age group. Volunteers age 65 and over spent a median of 90 hours on volunteer activities in 2012, the highest among any age group, and nearly twice the 50 median annual hours served by the general volunteer population. Volunteering has trended upward among teenagers (ages 16-19) over the past six years, up nearly 3 percentage points since 2007. Working mothers continue to volunteer at a significantly higher rate than the population as a whole and people who do not live with children under 18 (38.5 percent compared to 26.5 percent and 23.8 percent, respectively). The volunteer rate of parents with children under age 18 (33.5 percent) remained higher than the population as a whole (26.5 percent) and for persons who do not live with under 18 (23.8 percent). Volunteers are almost twice as likely to donate to charity as non-volunteers. Eight in ten (79.2 percent) volunteers donated to charity, compared to four in ten (40.4 percent) non-volunteers. Overall, half of all citizens (50.7 percent) donated at least $25 to charity in 2012. Want more details and data on volunteering in America? If you'd like to check out additional details and data (e.g. state and city rankings, demographic profiles, etc.) from the “Volunteering and Civic Life in America” report, you can find it here: http://www.volunteeringinamerica.gov/. For illustrated survey highlights you can check out their “Data Infographic” here. So as you start 2014 - what is the state of volunteering at your organization? Share your thoughts in the comments below.